For many art aficionados the heydays of the pop art movement between 1960s and 1970s were a fascinating time. Andy Warhol was at the forefront of disrupting the high art world, not only because of how it brought pop culture and consumerism in to elite gallery spaces, but also because of how he went from a career as a print ad illustrator to becoming one of the most dynamic artists in art history. 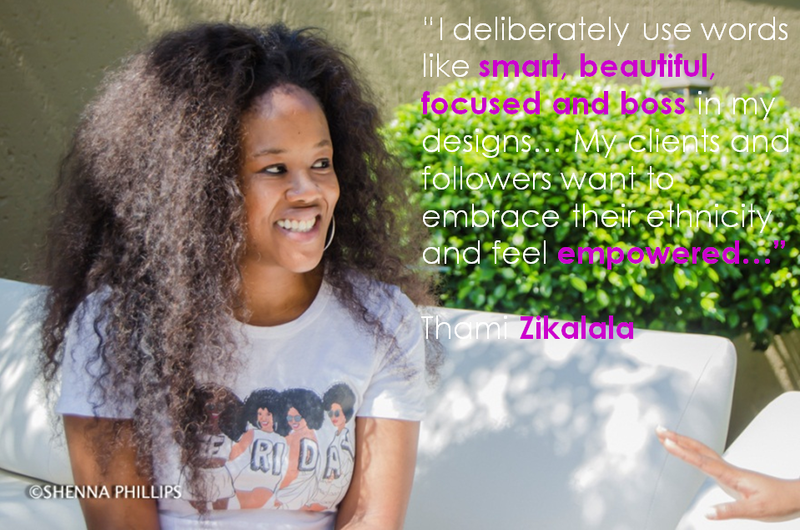 Half a century later, in the leafy suburbs of Johannesburg South Africa, Thami Zikalala is spending her nights building a solid portfolio of her own art work and networking with young pop culture influencers from around the world. Thami does this because she is acutely aware that we’re living in a world where customisation is the key to consumers, and, youth are playing a large role in shaping pop culture and driving consumerism across the globe. With this in mind, coupled with her artistic talents, she started a business called Misstpink Illustrations, creating customised every day products such as cell-phone covers, mugs, diaries and other functional items. 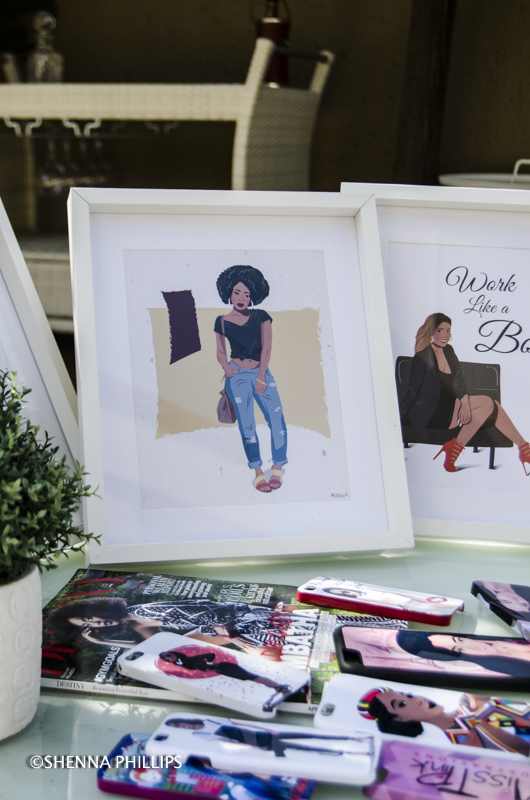 With a mere stroke of a brush, Thami merges illustration, design thinking, customization and pop culture lifestyle. And similarly, while Andy Warhol used images of iconic celebrities like Marilyn Monroe and Elvis Presley in his work, Thami has illustrated South African stars like Minnie Dlamini, Somizi and DJ Black Coffee, as well as international bloggers. 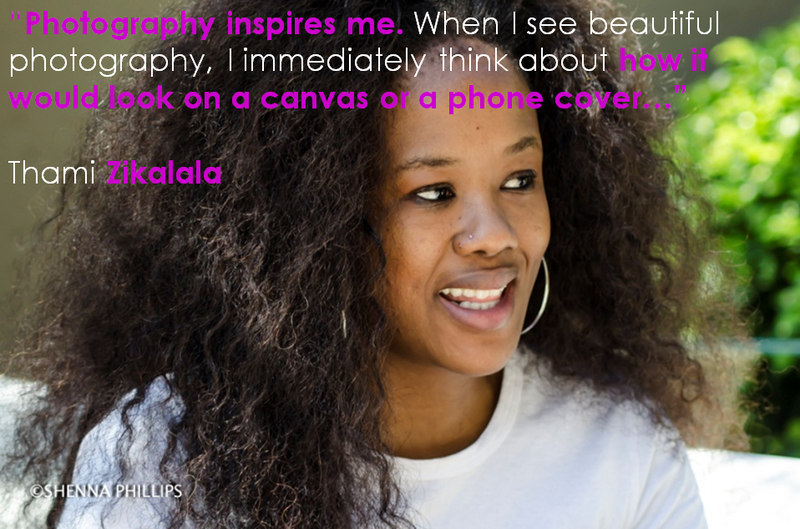 But what makes me personally connect with Zikalala’s work is how her products and illustrations aren’t just an accessible celebration of pop art and culture, they also aim to inspire. MR: I’ve been following your work on social media and I love how you customize items that you would use every day, like mugs, diaries, cell phone covers etc. In fact it reminded me of the “Share a Coke” campaign (click here for campaign story), where Coke replaced the position of their brand name on the centre of Coke bottles around the world with the names of ordinary people, and it became a huge hit for their brand. What inspired you to go down this creative path? TZ: I’ve actually never made that connection before with Coke, but I first noticed the growing trend and demand for customization Illustration when I joined Instagram. It was very inspiring to see designers using their skills on other platforms, art was no longer only on a canvas in a gallery or home, it could be on something as functional as your cell phone cover- and this blew me away. But then I thought to myself- Where can this be done locally? Who does this locally? And because no-one came to mind, I decided I would do this myself. I’m also a Graphic Designer and have an art background, so I knew that I could teach myself how to illustrate on Illustrator, and so the only other thing I needed to do was to source suppliers. It took well over a year for me to develop my technique and there’s still so much more to learn. As part of my initial learning process, I’d practice my art work and visit a Facebook group called South African Graphic Designers. The group encourages designers to share and critique art in the spirit of helping one another become better at their craft. When I shared my work I’d get very detailed feedback, and getting feedback from others who were my peers was incredibly helpful, because they would tell me exactly what I needed to work on to get better at illustrating. I’d also watch tutorials on YouTube specifically on topics I was working on improving and I saw myself starting to improve. I’m also a perfectionist so I take learning very seriously. MR: Where do you find your creative inspiration? TZ: I actually use Instagram a lot to get inspiration. I have an Instagram page that’s dedicated to my business. I use that page to follow other fashion illustrators, graphic designers and fine artists, they inspire me and share a common interest in illustration and design. TZ: … And Pop! Pop is the most prominent theme in my illustrations. And this is also where I try to balance out the work I do on building my generic designs versus my customized design, because I cater for a diverse set of customers. If my customers can’t afford the more expensive customized product, I offer them a range of generic illustrations which are cool but more accessible. But I must admit, designing generics is actually quite challenging, because you have to think outside the box about what will appeal to a mass audience as opposed to an individual. Over the years, I’ve noticed which of my designs are most popular and really resonate with my customers and followers. As you mentioned, the “Work like a Boss” and “Stay Focused and Fabulous” illustrations, the most popular designs are the ones that have empowering messages for women. My female customers love the everyday motivation and encouragement to be confident, be in charge and go places. I also deliberately use words like smart, beautiful, focused and boss in my designs because women identify with all these positive qualities. MR: I also think the beauty about being in the early stages of your business is that you can stay highly in tune with your customers, and it seems like you have access to your customers through various channels, predominantly social media. Geographically, where are you seeing most of your demand? TZ: I actually have a lot of demand from the US to illustrate, especially with hair bloggers who have a big following. What I’ve learnt about my clients is that they want to embrace their ethnicity and feel empowered, which I capture in my art. Also, when they share the work that I’ve done for them on social media, I get more likes and even more demand for my work follows. So, whenever I see the likes on my social media pages suddenly spike, I know I’m on to something hot. And, if a customized illustration becomes really popular, then I look at ways to reuse the concept and / or make a generic version of it. But what’s also been great about illustrating local celebrities like Black Coffee, Tumi Voster, Amanda du Pont, Nandi Mngoma and Minnie Dlamini, is that they show support and appreciate by sharing my work with their audience on social media. This has also helped raise my profile and also connected me to their fans who may approach me to make them a product with their favorite celeb’s image on it. MR: With all your incredible talent, I’m curious about what your bigger dream is for you and your business? TZ: I see my business growing into retail and having stores similar to the Australian company, Typo. But, at this stage I’m still focused on building my portfolio, creating more demand and I’m close to finishing off my post-graduate degree in Graphic Design. Interestingly, my dissertation is also focused on researching how to create generic designs that appeal specifically to youth. So I’ll be using my dissertation and my business experience to build the intellectual property of my business, expand my client base and pursue a retail deal. Alternatively, because I’ve got a lot of international demand, I may also see where that takes me and pursue work opportunities abroad. I recently watched an interview with the high-powered CEO of PepsiCo, Indra Nooyi. Interestingly, a major theme she raised was the importance of design thinking in any organization. She defined design as “something you embed in a product that romances the consumer and draws them to that product”. Nooyi then spoke about how her challenge, when she became CEO, was that PepsiCo had an old school view of design largely because it was a heritage brand. And so, what she did to learn how to change this was spend time shadowing Steve Jobs, to learn more about his design philosophy and how he entrenched his thinking at Apple. Popular global brands have the constant challenge of thinking outside the box to develop designs that will capture a massive consumer base, while appealing to our growing soft spot for customization. Thami is rising up to this challenge too, while her consumer base continues to expand. Looking at Thami’s international growth and prospects, I can’t help but think this is a sign of something significant. Thami is not only stretching herself to become a more dynamic artist, she’s showing how South African art and culture can influence global trends and empower.